Curious how to light your deck to make the space more functional? It’s hard to resist basking in those cool evening temperatures. But it can also be hard to keep the party going in total darkness. Or even worse, maybe you have harsh flood lights illuminating your deck after dark. Both situations are not ideal for relaxing or partying. Some good lighting would go a long way to improve the look and function of your deck for those evening gatherings. They may not be everybody’s top choice, but rope lights have a lot going for them. First off, they are weather-resistant. Rope lights are easy to install along deck edges or under hand rails. When installed this way, they become recessed lighting that illuminates walkways without blasting harsh light at your eyes. They are durable and long-lasting. You can leave them out all year and they will always compliment your outdoor space. If your outdoor lighting needs are not consistent, a few portable lanterns could make a huge difference for your cookouts. Lanterns are a versatile addition to your lighting scheme because you can move them around as needed. Whether it’s a dark buffet table or a heated game of cards, a lantern or two can solve many lighting problems. Does your landscaping include paths, patios, or sidewalks? 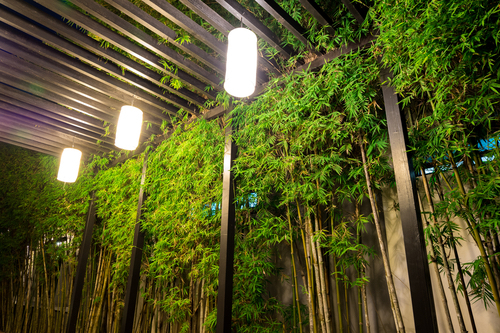 These are great places to add walkway lighting. There are some wonderful solar lights on the market that will last a long time and provide superb lighting at night. Or if you want to wire them to your existing system, a good installer will make short work of this improvement project. If your deck has an overhang above it, a bold outdoor chandelier can provide ideal illumination and a focal point for your deck’s lighting scheme. Weather-resistant lighting fixtures come in a range of styles and colors to suit your taste. Choose dimmable light bulbs for maximum effect. For reliable illumination of tables, grills, and other high-use areas, you can’t beat spotlights. You no longer have to have super bright bulbs for spotlights, which makes these a more pleasant option for your deck illumination needs. A soft but steady spotlight can help you set the tone for the perfect evening events out on your deck. Georgia trusts Wahoo Decks for all their deck needs. From lighting and stereos to deck construction, we can help you design the right setup for your backyard. Complete our contact form online today so we can light your deck right away. Why Should I Use Aluminum Decking For My Outdoor Living Space?